Paul Sellers holds a piece of picture frame molding on the miter shooting board he just made. When I met Paul Sellers at The Woodworking Show this past Sunday, I watched him build a simple miter shooting board. This allowed him to precisely tune miter joints for picture frames. I had intended to post a video of it, but failed to record it properly. So I made my own video building one. Meanwhile, Nick Roulleau, who owns Mansfield Fine Furniture and also attended the show, had the same idea. He made a very nice video you can see here on his blog. Nick and I did things pretty similarly, but there are some differences. Each board has two angled fences for the opposing miter cuts, formed with a 1:7 angle on one side to wedge into large dadoes cut into the surface. Accurate dadoes are the key to the board's precision, because they hold the fences at the proper angles. I oriented my fence blocks on the board such that the 45's were inside the fences, which is how Paul made his (note that he holds the workpiece on the inside of the fences in the photo above). Nick oriented his such that the 45's were outside the fences, which is the more common method I've seen in books, such as Bernard E. Jones' circa 1918 The Practical Woodworker. Both methods work, but the way I did mine, I have to remove the fence block for one side in order to shoot the opposite miter. The other thing I could have done was make the board longer, so that there was room between the two fences. My video is a little more of the Benny Hill version. You can see the process, but I've sped it up so much for brevity that it's almost comical. My hands never looked so sure handling the tools! I'll make another one of these with the fences oriented like Nick's. The other thing is that Paul used narrower stock for his board, so the dadoes required less work. I'll do that as well. You need to do a careful job making one of these in order to get good joints, but the process is pretty easy. If necessary you can throw one together quickly in the middle of a project or on a job site. The method for a 90-degree shooting board is the same, except that you just need one fence, squared across. Well, the one he uses in the other video is actually a 90-degree and one 45-degree, yet another variation! 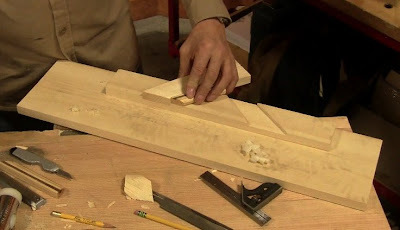 It's also possible he made this one this way because that was the piece he had handy, with one dado already cut in it when he grabbed it to demonstrate. What is the advantage of dadoes and wedges vs. just screwing the fences to the board? I guess you can then take a narrow piece, put it *in* the dado and wedge it firm, while wider pieces are easy enough to hold by hand? I'd imagine having a larger bearing surface keeps things true longer - I've got a shooting board that I've had to redrill and replace the screws on because eventually the force of planing has made the thing out of square, and the holes have worn themselves a bit larger.. This video was great. The sound effects really put it over the top for me. I'm thinking lots of woodworking videos could use this treatment. Thanks, guys! Hopefully the part 2 post cleared up some questions. Specifically, the use of wedged stops means you can clean them up or replace them after they get chewed up over time. The other nice thing about the dadoes is that they are absolutely fixed in position. They won't shift around the way stops that are screwed down can. Just make sure the wedges are tapped firmly into position.